From the website, web forms can directly create customer accounts that then can generate leads and feed email campaigns. Web forms can also submit trouble tickets through to the Help desk, complete with auto-responders. rave7™ allows you to get all of your forms on-line without any programming at all. Not just forms within rave7™, but any form you may require for your Intranet, or Internet web sites. Our form design wizard is compatible with all browsers. Create as many forms and surveys as you need without restriction. As soon as someone submits one of your forms, rave7™ will automatically and immediately send them a response you can customize. This is very important because users expect a reply from you. You can actually attach 2 auto-responders to each form you create. One can display some text to the user, and the other can email your response to them. Your visitors can upload files with your forms and the file will be included with your email notification, or be attached to a case. The email address used to send you your notification is never available on the form or in hidden fields. This way "spambots" cannot search your forms and find your email address. As soon as someone submits one of your forms, the form data will be emailed to you as plain text or as a formatted HTML email. The forms designer is not just about HTML forms. You can also create full web pages with our content management features. You can also create blocks of HTML text that can be included on any form. Member management that allows your customers to create an online account with you. The customer can then login to your site and update their profile at any time. There is also a forgot password option. Once logged in, any form the user opens will automatically be populated with their information saving them time interacting with you! And one of the best things about our plugins, is that you can plug-in any of the above option into any form with just 3 clicks! rave7™ allows you to use our Web based form design wizard to design your HTML forms. This wizard does not require you to know any HTML programming! The auto-responder allows you to send a message back to the user immediately after they submit a form. You can use a WYSIWYG editor to design a responder, and then apply a responder to a form. You can email the submitted for data to any email address, or several addresses. Once the form is submitted, the user can automatically be redirected to any other URL. Form background color and text colors can be customized. You can also add your own images anywhere on the form to further customize its appearance. It's one thing to receive the form data, it's another thing to be able to properly manage it. 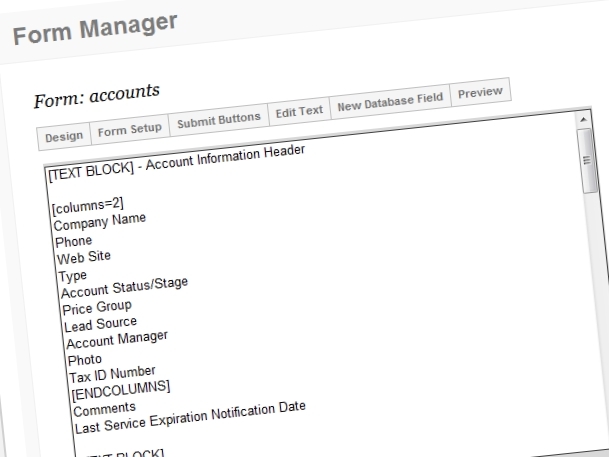 rave7 enables you to manage the data received by your form submissions via the Help Desk. The program also allows you to assign a label to a form, and you can view the submissions of that form by label in the all open area of the Help Desk. The form designer supports simple calculated fields to create totals.